Slovenia and Croatia, two parts of the now-defunct Federal Yugoslavia, are going through the worst crisis in their history over an information leak during ongoing arbitration hearings meant to delineate the two countries' sea and land border. The fallout from the border arbitration phonetapping scandal continued on Tuesday with Croatia deciding to withdraw from the arbitration treaty, something that Slovenia deems unacceptable. Croatian Prime Minister Zoran Milanovic said Monday his government wants to withdraw from border arbitration with Slovenia following revelations that one of the judges had violated rules for the international panel. The arbitration between Croatia and Slovenia, brokered by the European Commission, concerning delimitation of the maritime and land boundary between the two states, has been ongoing over the past three years. All of this progress towards the peaceful settlement of the dispute was thrown into sudden doubt by the revelation that an arbitrator of Slovenian nationality was secretly in contact with a Slovenian agent to decide how best to influence the other arbitrators to rule in Slovenia’s favor. The daily newspaper Vecernji List published ''wiretaps',' showing that Slovenian judge Jernej Sekolec used to make telephone contact with Simona Drenik, the diplomatic representative of the Foreign Ministry in Ljubljana. Between November 2014 and January 2015, Sekolec informed Drenik about the ongoing arbitration proceedings, awaiting suggestions from Ljubljana on how to behave. A framework favorable to Slovenia emerged in the newly published wiretaps, especially with regards to the maritime border. Croatia and Slovenia have been f engaged in a dispute on the demarcation of the sea border in the northern Adriatic Piran Bay for years. The sides have failed to overcome the differences since 1991, when both republics of the former Yugoslavia declared their independence. Croatia insists that the border be marked in the middle of the bay, while Slovenia fears this will practically deprive it of access to the sea. Meanwhile, Russian Prime Minister Dmitry Medvedev expressed hope on Monday that the incident would not worsen the situation in the Balkan region. 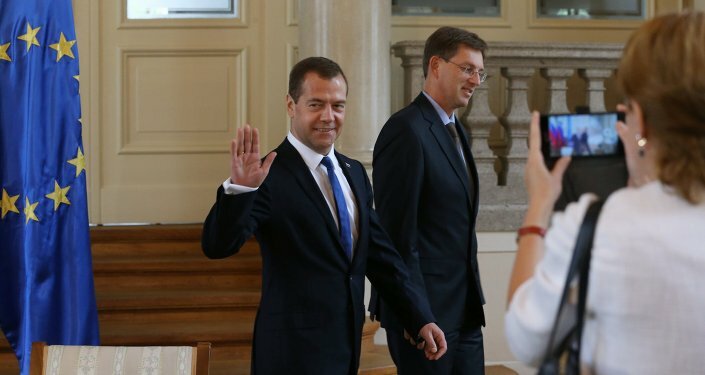 "I hope that scandals of this kind will not mar the situation in the Balkans and your cooperation," Medvedev said after talks in Ljubljana with his Slovenian counterpart Miro Cerar, commenting on the wiretap scandal in which the Slovenian member of the arbitration tribunal resigned. Miro Cerar said he wanted each of the sides to do all possible in the spirit of good-neighborly relations to have the arbitration process continue.